By using some simple hardware and the Arduino analogue input pin, Darius has completed a simple device that can monitor the discharge rate of a lithium-ion battery pack. The data is sent back to a host PC via serial to allow constant monitoring. If you're making your own version, note that the maximum raw input voltage from the battery pack is 5V! 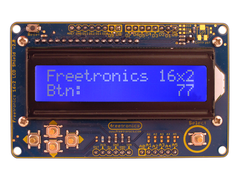 For more information, notes and the Arduino sketch head over to the project page here. And we're on twitter and Google+, so follow us for news and product updates as well.